Few have what it takes to rock the legend in Freeborn Red (309). But those who do, tend to be diehard Land Cruiser fans. The owner of this red-hot weekender is no exception. His first Land Cruiser memory is riding up to Lake Placid, NY in his dad's old '72. Now he can continue the tradition, or start a new one, in an FJ40 of his own. Nothing compares to the look of the original Land Cruiser with its exposed bolts, metal latches, and heavy-duty tires. It is durable and utilitarian — unlike anything else on the road today. That’s why our work always begins with the steel body of the original. In this case, we converted a hardtop into a soft top. We perfected and repainted every inch of steel and equipped this FJ40 with a custom-tailored canvas soft top with three removable windows — something our client will appreciate when things heat up in Tarrytown, New York. If you grew up with an old-school Land Cruiser, the sound of that 2F engine never fails to bring a smile to your face. And there’s no skimping on the nostalgia here. 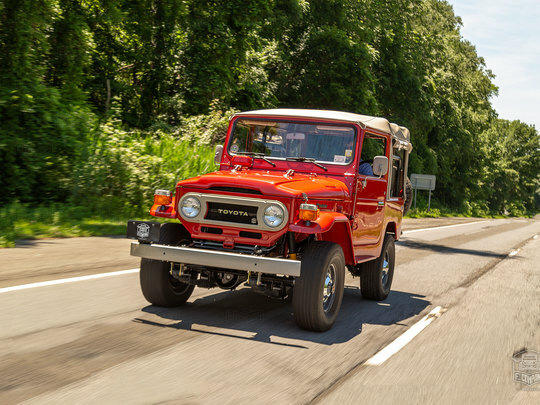 From its 4-speed manual gearbox to its off-road prowess, the FJ40 is about as close to the original as you can get. However, with upgraded running gear, we'd argue this one's actually more fun to drive. After all, this FJ40 now includes essentials no driver should be without, like updated suspension, power steering, and front disc brakes. Inside, you’ll find a cabin that stays true to the original design with discreet modern upgrades. There’s a classic 60/40 split bench up front and jump seats in the back — all trimmed in gray vinyl. The stock heater warms things up on cold days, while the built-in speakers and vintage-looking receiver bring modern sound and Bluetooth streaming to the classic cabin.